Louisa May Alcott, the author of Little Women, was preoccupied with what constituted women’s work, and how the Industrial Revolution spurred changes in a woman’s power to earn a living – so much so that, following the success of Little Women, she would go on to publish a semi-autobiographical novel called Work: A Story of Experience. Reges, Margaret. 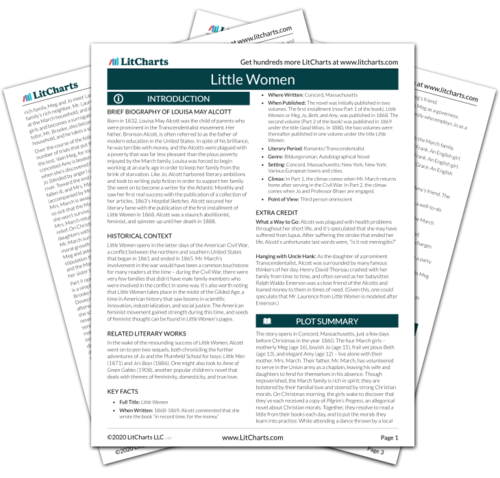 "Little Women Themes." LitCharts. LitCharts LLC, 24 Nov 2014. Web. 22 Apr 2019. Reges, Margaret. 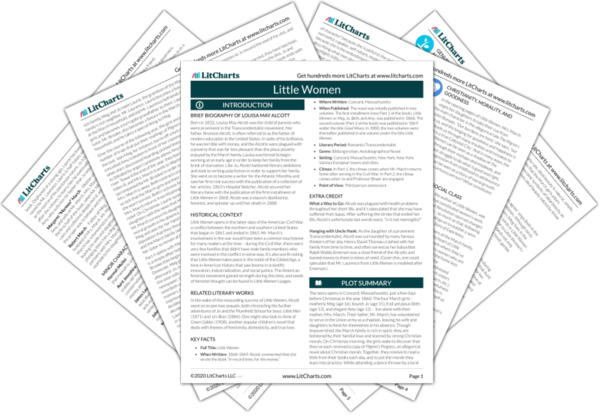 "Little Women Themes." LitCharts LLC, November 24, 2014. Retrieved April 22, 2019. https://www.litcharts.com/lit/little-women/themes.